5. Photograph when the lighting is right. Photography is all about capturing light. 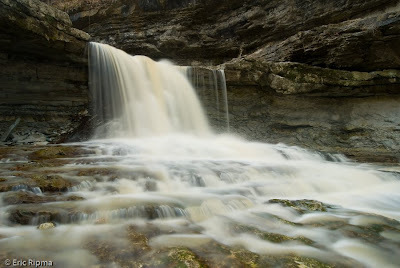 The best times to photograph waterfalls are cloudy days. For the most part direct sun on any falls will not enhance the image in any way, of course there are times when this rule should be broken. 4. Use foreground features. It is important not to only include the waterfall in the picture. Lines in the foreground that lead to the waterfall and swirling leaves/bubbles both enhance the image when used properly. 3. Use a polarizing filter. A polarizing filter is used to cut down reflections. It is very useful when working around waterfalls to give the rocks around the falls their actual color instead of just a reflection. 2. Use slow shutter speeds. The use of slow shutter speeds creates a more pleasing image. It makes the image have more of a calm mood. 1. Use a tripod. If you have a tripod use it if you don't buy one (even cheap ones will work well), there is no way to use slow shutter speeds without a tripod. It also allows for a much sharper image at any shutter speed. I took this one on a cloudy day. To add interest I included much of the area around the falls so people could see the whole area not just the waterfall. This is an example of a leading line. 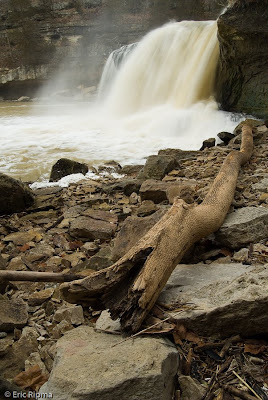 The fallen tree works well to draw the viewers eyes through the photo and eventually to the falls itself. Nice photography tips. Don't think I've heard the polarizing filter one. Will have to try it the next time I have an opportunity. Nice photos. Thanks for sharing. Nice tips and pictures. I've found that neutral density filters can help on bright days as well or if you just want some crazy long, 30+ second shutter speeds. Thank you,thank you for the tips.I have been having such a hard tine photographing water,I truly appreciate this. You always have so lovely shots of waterfalls! And thanks so much for nice tips! These are beautiful. I'm certainly going to take your tips into consideration. I love the way the water looks in the falls. I love your tips, they're very helpful to a novice photographer. And your shots prove that you know what you're talking about ;-) Beautiful waterfall shots. Thank you - I've really been learning a lot by blogging - Can't wait til Spring, so I can put it all to the test. If we could just get rid of all this cold weather! Thank you for the tips.Will have to try it the next time I have an opportunity.You have so lovely shots of waterfalls. Nice falls! And thanks for the tips. Thanks for the tips. You've got a couple of great pictures in this post. ...this is very interesting. I took some photos of the waterfall at Sharon Woods this weekend, and they turned out so-so. I was doing it all wrong. I'm going to try again soon. These tips are great. I always love your waterfall photos. Beautiful! I like the way you used the fallen tree in the second one. Your waterfall shot is so beautiful. So powerful and elegant all at once. And thank you also for your visit.